I like this one, a whole lot! Me too, this was taken about 3 months before I was hatched…………. All those little spikes atop the wall have grown into a full-size fence over the years! This brings back memories. I recall the lifeguard making me swim the length of the pool and back before letting me play in the deep pool. Used to swim there in the mid-sixties. Lots of good memories. My friends and I climbed that fence and went swimming at night, all through the eighties (bad Dan, I Know). Behind the pool on the right. That small grassy field is where the new gym would eventually be build…not sure when. I used to swim here also. As I went to Grant 65-69 I noticed in this picture the new or boy’s gym had not been built yet. Grew up on 32 and Ainsworth. Used to take the 33rd bus to swim here. Since I was 10 at the time, and spent many a summer day there, I may very well be in that mass of swimmers! I have lots of good memories here with my brother and sister along with neighborhood kids when we rode our bikes from 23rd & Alberta down 33rd St hill to the pool! That seemed like we had gone miles and miles to get there, when actually it’s not that far. What a photo. I grew up in the neighborhood, went to Grant, and swam at the pool countless times. That wall is now extended with a tall fence, although it didn’t stop us from night swims in high school (early 2000s). Not only is the new gym not in existence yet in this picture, but the parking lot is also missing. There’s a walkway and a portable classroom, or what looks to be one, where a parking lot is currently located. 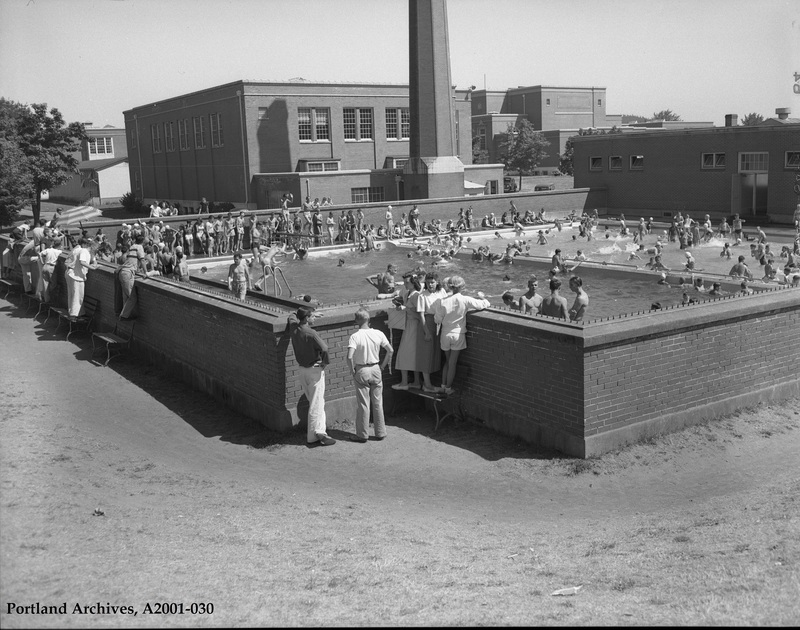 The pool entrance / dressing rooms have undergone a lot of improvements, but the basic layout and structure of this pool scene is mostly still intact today. That is where I learned to swim. I had been tentative about going into deep end and someone picked me from behind and threw me in right below the lifeguard stand. I never knew who did it. It was probably the lifeguard. It was a crowded day. I still remember the feeling when I knew I could swim. It was like learning I could ride a bike. My brothers and I started going there in 1954 or 1955 every summer day. Even went out for the swim team (bust). We lived a mile from it and walking home we were famished so we stop at Grant park Pharmacy and buy a bag of popcorn from the popcorn machine for 5 cents. The worst thing that could happen would be when someone threw and broke a bottle in there and they had to drain it. Filling a swimming pool with water fresh off of the slopes of Mount Hood did not make for a good swim so we had to wait a couple of days for it to warm up. The only thing sold in the park back there was snow cones from popcorn wagon. You would get thrown out of the pool if you were caught “going over the wall” from the shallow side to the deep end. One time the lifeguard got so mad at us that he through our whole family out in one fell swoop. Sometimes we would go up for “family night” swims with our parents. Those were great nights because the pool was not crowded at all. We never got thrown out on family night. Those lazy crazy days of summer. This must be late 50s, after the polio vaccine was released. I know my family did not allow me or my sister to go to a public pool before that glorious day. I love everything about this picture. More like this please. The polio vaccine: almost everybody in the US lining up in school gymnasiums, fraternal halls and almost everyplace big enough to hold a crowd of people to get your regimen of three sugar cubes. Everybody my age and older had seen what polio could do. Because I had CP and went to Holiday Center for Crippled Children from the time I was 3 until I was 9 I saw first hand it devastating effects. My dad’s best friend and my babysitter next door had both been it’s victims. Probably why I get so mad today about people who are against vaccines. I guess they aren’t scared enough of the alternative. On a lighter beat I also remember the sno cones and the popcorn. They also had an afternoon swim session for the mothers(remember this was the day when most did not work) and their children.. I remember lining up at Grant HS for the sugar cubes. I think my first vaccine was a shot & was really happy when they changed to sugar cubes. Nice pic, can’t wait to show it to relatives that went to Grant in the 60’s. Btw…anyone catch the diver center left? Looks like he’s skinny dipping right in on a hot summer’s day!